Whatever the benefits, the intent of these services isn’t just to benevolently help us find the things we’re looking for. They’re also designed to help companies find unwitting customers. When you open your web browser to shop for a product&#151or really for any other reason&#151you yourself are a product whose personal information is literally being sold. Companies that you know, like Google and Facebook, and companies you’ve probably never heard of (e.g. Acxiom) are using increasingly sophisticated programs to map your personality. And it’s not just creepiness and individual privacy that’s at issue here. Personalization is also adding to a civic crisis. It’s one thing for code to help us find music, movies and other consumer products we like. But what about when code also feeds us our preferred news and political opinions, shielding us from alternative viewpoints? Personalization now means that you and your Republican uncle will see dramatically different results when you run the same exact Google news search. You’re both likely to see results that come from news sources that you prefer &#151 sources that tend to reinforce your existing opinions. Maybe your search will pull articles from NPR and Huffington Post, while his will spotlight stories from FOX News. Both of you will have your biases and worldviews fed back to you &#151 typically without even being aware that your news feed has been personalized. Web personalization is invisibly creating individual-tailored information universes. Each of us is increasingly surrounded by information that affirms&#151rather than challenges&#151our existing opinions, biases, worldviews, and identities. If you’re an activist, then probably a lot of your Facebook friends are activists too. Your friend Susan has been posting all week about the public workers in Wisconsin. Jacob posted an insightful read about white privilege that’s at the top of your newsfeed &#151 50 of your friends “like” it. Sam is a climate activist, and her Facebook presence reflects it. And you just posted an article about an upcoming protest to end the U.S. occupation in Afghanistan. When you log in on Facebook as an activist, it might feel like you’re part of a mass movement. Social justice issues are front and center &#151 as if that were the main thing people used Facebook for. That’s how web personalization works on Facebook. When you click on a lot of posts about gay marriage, you will start seeing more similar posts. When you check out certain people’s profiles, they’ll show up more often in your newsfeed. If these folks think a lot like you do, you’ll see a lot of stuff that reinforces your worldview. It’s fun and validating to see a lot of stuff you agree with. But consider the implications. People who are opposed to gay marriage are seeing a lot of articles that reinforce their beliefs too. And, perhaps more important, folks who aren’t that interested in the issue probably won’t see anything about it at all. Maybe you fancy yourself an agitator with your Facebook posts, but the folks who might feel agitated&#151and the more persuadable folks in the middle&#151typically aren’t seeing those posts at all. Furthermore, even if you think you’re right about all your beliefs, how are you going to be equipped to persuade others if you’re not exposed to their views? You can spend your whole day expressing your political identity on Facebook. You can also use it to mobilize the usual suspects to take some online action &#151 or maybe even to get some of them out to an “offline” political event. But to mistake this kind of thing for grassroots organizing is a big problem. Grassroots organizing is a process that happens within&#151and within deep relationship to&#151already constituted social blocs. It’s a process of articulating demands in language that means something to the community and making those demands actionable. It is moving the community into action as a community &#151 not just fishing for a handful of radicals who come out as individuals. But most activist spaces today are spaces for self-selectors, where folks do enter as individuals. And to really enter these spaces, you often have to assimilate to an activist subculture, and check some aspects of your identity at the door. I don’t know of any mass movement in the history of the world that was composed of all self-selecting individuals (at least no movement that lasted longer than a flash). Take the Civil Rights Movement. If Bob Moses, Ella Baker, Martin Luther King, and Rosa Parks had been oriented toward the center of a small circle of self-selectors, they would not have been the leaders of a movement. (Picture them inspiring each other with status updates like, “No one should have to give up their bus seat because of the color of their skin. Please post as your status if you agree.”) It only became a movement when these and other good leaders helped to move whole communities&#151most notably black churches and schools&#151into action as communities. Membership in these communities came to imply movement participation. This is how movements become movements. Web personalization shouldn’t be blamed for starting this pattern where people gravitate toward the things they “Like”™. Eli is quick to point out how Americans had been clustering into likeminded groups for a few decades before the web was even a big deal. We have literally been migrating into values-homogenous social spaces since the late 1960s. Discussing the ideas of Ron Inglehart, Bill Bishop, Robert Putnam, and others, Eli paints a picture of an increasingly fractured society. For the past four decades or so we’ve been rearranging our lives to surround ourselves with people who think a lot like we do &#151 phasing out folks who don’t share our opinions and tastes. We’ve chosen our neighborhoods, religious congregations, civic and political organizations, the cultural spaces we frequent, and our friendship circles so that we can experience our worldview reflected back to us and minimize dissonance. With or without web personalization, it makes sense that we would continue to follow the same pattern in our online communities. So what’s the big deal? I like my friends and I’m glad they share my values. It’s affirming. It makes me feel good. I can relax in like-minded company. What’s the problem? Eli discusses several problems with this trend. I want to discuss, for an activist audience, a political problem &#151 political in the sense of collective power. My friends and I may be satisfying our identity needs when we talk politics at the bar&#151or when we share political posts on each other’s Facebook walls&#151but what are we accomplishing? What can we accomplish? What do we, as a small, self-selecting, self-segregating group of folks have the capacity to accomplish &#151 if we’re not connecting with others? See, if you love to play the online game World of Warcraft and&#151for reasons I can only guess at&#151you want to spend all your time doing that, then living in a bubble doesn’t pose much of a problem for you. By surrounding yourself with other folks who are equally obsessed with this admittedly pretty cool videogame, you can be an all-W.O.W.-all-the-time kind of person. Best to you. If, on the other hand, you set out to stop global warming, you will absolutely fail if you only surround yourself with people just like you. You need a heck of a lot more people to get on board. The magnitude of your task demands that you break out of your activist ghetto and go beyond the boundaries of self-selection. If you want to build the kind of collective power needed to take on the fossil fuel industries&#151with all their money, power, and entrenched webs of influence&#151then you have to somehow infuse your goal into the identities of many, many sectors of society. But are you, climate activist, up for this task? Or will you instead orient yourself toward the center of a small, insular climate activist subculture? Will you frame your message strategically to connect with people who live beyond the boundaries of your group? Or will you content yourself to signal only to your friends? The world may be going to hell in a hand basket, but at least you’re there taking a righteous stand, surrounded by other righteous eco-warriors, right? As a grassroots organizer, one of things that troubles me most about the filter bubble is its potential to take the tendency of insularity among would-be social change agents and to inject it with steroids. I’ve seen some of the most committed social justice activists strangely resembling folks who are obsessed with World of Warcraft. They structure their lives around something that they’re really into. And no one else is paying attention. In a society that is self-selecting into ever more specific micro-aggregations, it makes sense that “activism” itself could become one such little niche. But when it comes to challenging entrenched power, we need more than little niches. We need huge swaths of society bought in. …the Internet has unleashed the coordinated energy of a whole new generation of activists&#151it’s easier than ever to find people who share your political passions. But while it’s easier than ever to bring a group of people together, as personalization advances it’ll become harder for any given group to reach a broad audience. In some ways, personalization poses a threat to public life itself. If we’re not intentional, the task of reaching a broader audience won’t just be harder; it’ll be hopeless. If activists are themselves ensnared in self-selecting, self-affirming&#151one might even say narcissistic&#151filter bubbles, they will lack even the inclination to attempt bridging beyond the boundaries of comfortable little clubs. Political expression that doesn’t engage beyond self-selectors is essentially apolitical. There is no politics without friction. Civics is not easy or clean or pure or contained. It’s messy. Civic engagement requires us to break out of bubbles, to dive into the mess, and to lean into the friction. The hopeful nugget here is that social change work has always started with a belief that reality is dynamic, not static. Things change all the time, even seemingly fixed structures. And we can step up and be self-conscious agents who influence the direction of change. The filter bubble, and all the constraints that come along with it, is another kind of structure we have to engage. Recognizing the structure is an important first step. To that end, Eli’s book is a great contribution. Then we’ve got to do some stuff that may make us feel uncomfortable. Bob Moses wouldn’t have been a leader in the Civil Rights Movement if he had stayed in the north and only surrounded himself with other Harvard-educated young black academics and professionals. For the Student Nonviolent Coordinating Committee (SNCC) to help catalyze a movement, he and others would have to enter some of the most dangerous segregated areas in the South and talk with some of the poorest, least educated, and most disenfranchised people in the entire country &#151 probably at times an altogether uncomfortable experience. While Bob Moses sets a pretty high measure to compare ourselves with, perhaps we can at least take a little inspiration and conceptual wisdom from his approach. If he and other Civil Rights leaders could muster the courage to step so far out of their comfort zones, perhaps we can at least start consciously taking a few small steps in that direction. 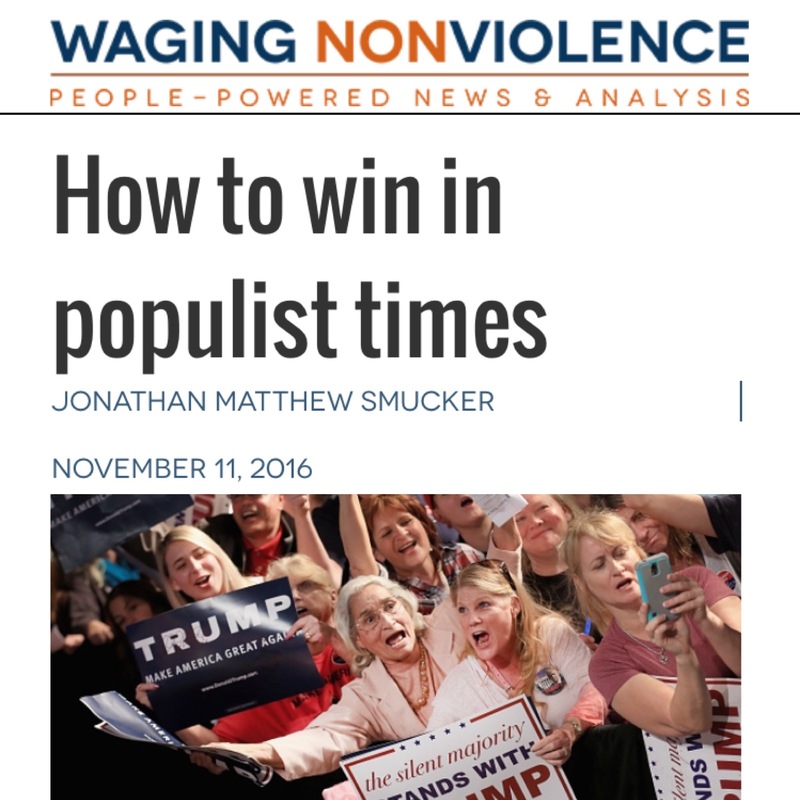 Jonathan Matthew Smucker is a grassroots organizer, strategist and trainer. He serves as Director of Beyond the Choir.